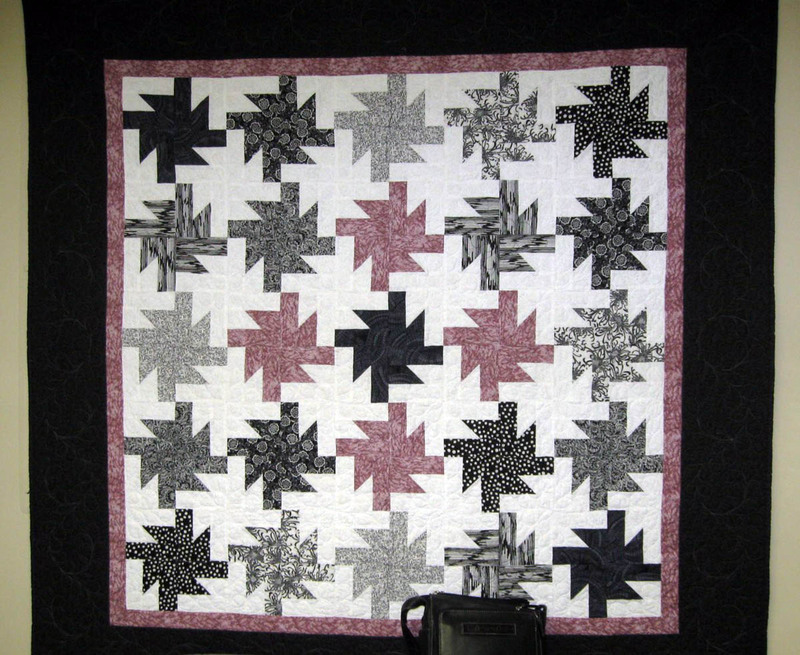 In the northeast corner of Tennessee is Quilted Blessings Quilt Shop, located in Blountville, TN. The shop's owner, Pam Sprinkle, began offering professional machine quilting services in 2004 and through the years, her work has been accepted into national and international quilt shows such as the International Quilt Show (2006), and it has won awards at AQS in Paducah (3rd prize, 2007), and a 1st Place at the Machine Quilters Expo (2008). 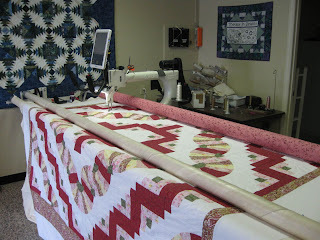 A very accomplished machine quilter she is, indeed! Pam's A-1 long arm occupies the center of the shop's space, and a few examples of her work hang on the walls. 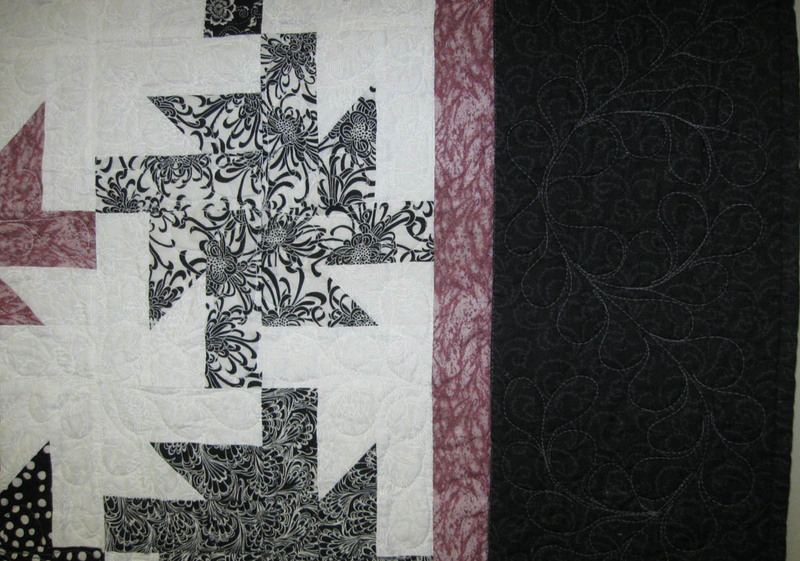 These pictures don't do justice to her masterful machine work, so be sure you check her Photo Gallery to see more details of the quilting. A log cabin variation in browns and reds. Close up of the machine quilting on the log cabin quilt. 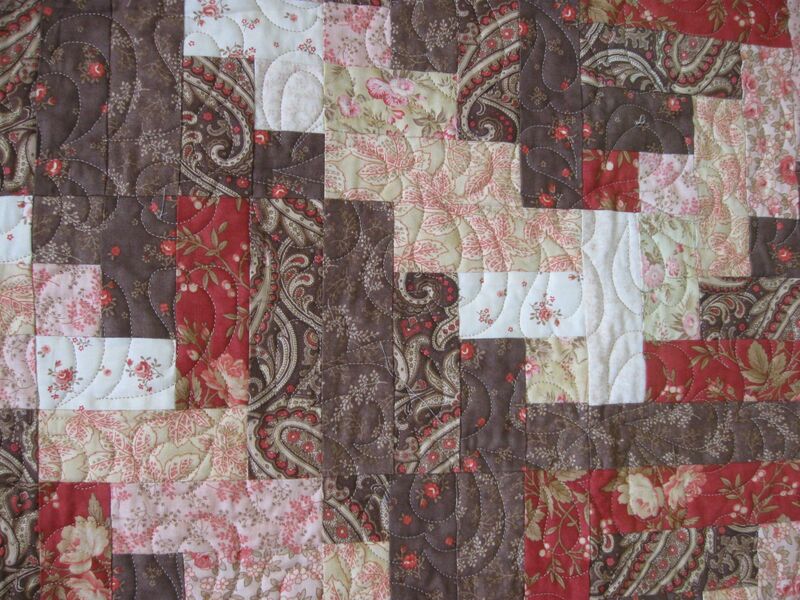 Simple, traditional quilt blocks and quilts with wide borders provide a wonderful canvas for machine quilting. 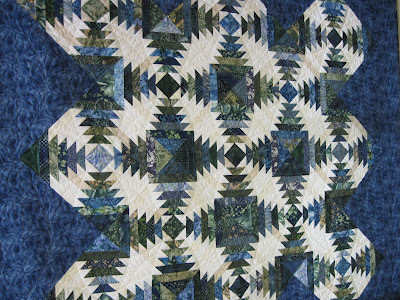 A blue and white pineapple block quilt is accentuated by Pam's custom machine quilting. 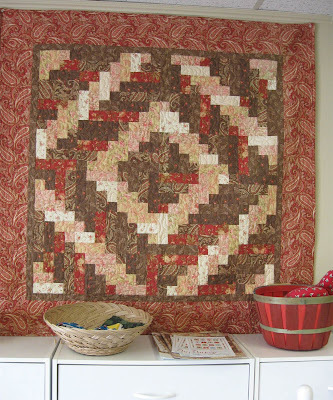 This pineapple block quilt (above) remained unquilted for some time before Pam was inspired to do some custom quilting in the light fabric areas. It is beautiful! 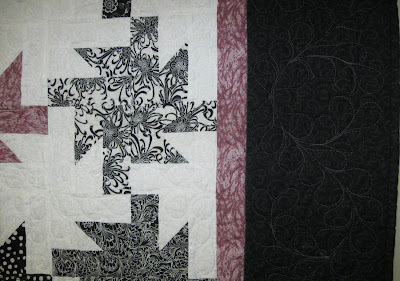 I remember making a quilt with this fabric line (below) by Sandy Gervais. With the autumn season right around the corner, it was nice to see this collection again. 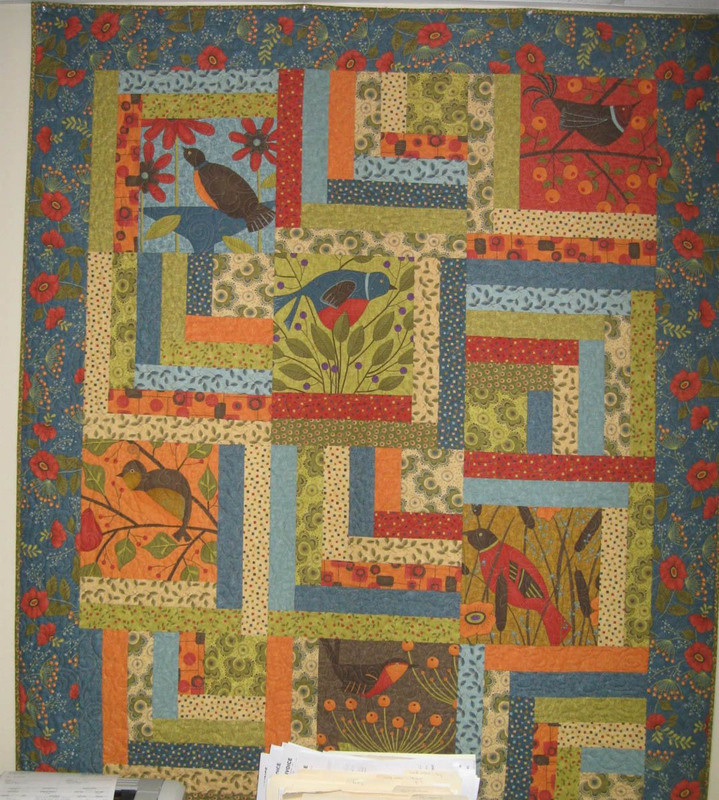 Quilt made with a fabric collection designed by Sandy Gervaise. 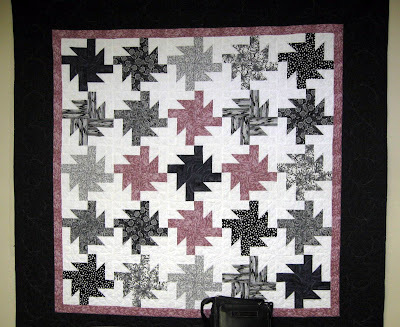 In addition to the ancillary services for machine quilting (machine basting for hand quilters, binding, hanging sleeves), Pam has expanded her offerings to include making and quilting T-shirt quilts. Taking a collection of T-shirts and making them into a quilt warms the heart as well as the body. 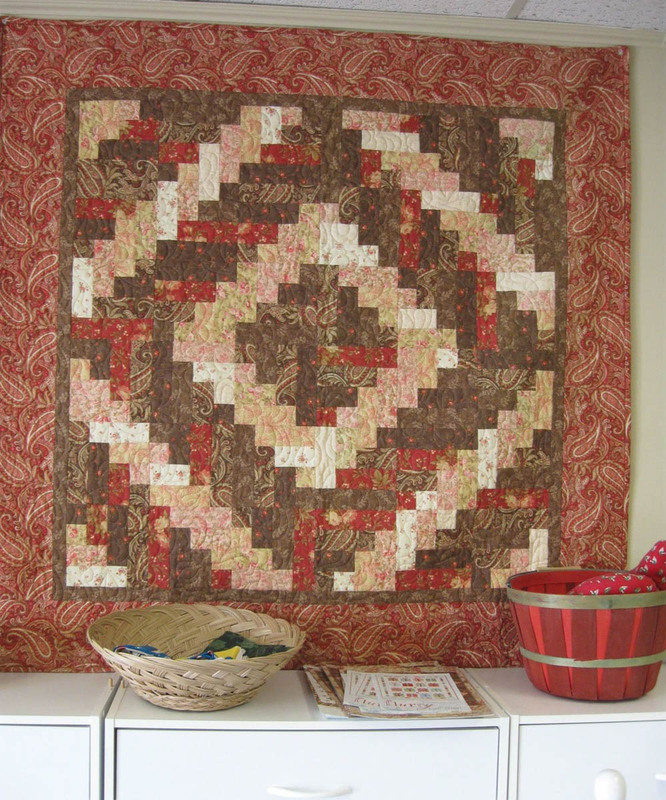 These quilts make great gifts as well as preserve some of your favorite memories. And, with Pam's expertise in machine quilting, you'll have a cherished heirloom that is as beautiful as the memories it celebrates! Quilted Blessings long arm machine quilting, Blountville, TN. 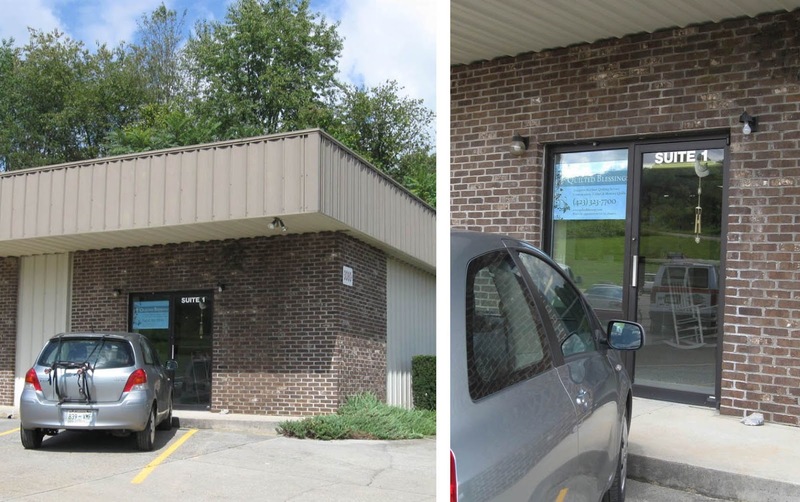 Quilted Blessings is in the corner office space and there is a nice big parking lot in front.